Arrenurus berolinensis Protz, 1896 is a very rare water mite, previously known from three lo-calities only. Protz (1896) described the species first time from Fenn of the Grunewaldsee near Berlin. Therefore, the species’ name is reminding of Berlin (= Berolinum). Second, Viets (1911) reported it from Perwilten in Eastern Prussia, nowadays in the Russian enclave Kaliningrad, where the species had been collected in Septem-ber 1907. However, both records were only re-ported for male specimens, and no finding of a female specimen has been reported. As third rec-ord, four males and one female were collected from the northwest of the province of Overijssel, the Netherlands and the first description of the female was done by Smit (2007). In the present study, we have collected four male specimens of A. berolinensis from Karakuyu Lake in Dinar District of Afyonkarahisar Province of Turkey. In the present study, four male individuals were examined. The samples obtained from the lake of Karakuyu, province of Afyonkarahisar, Turkey, N 38° 03’ E 30° 14’. All the samples were deposited in the Zoological Laboratory of the University of Afyon Kocatepe (Figure 1). Male: Idiosoma 981 μm long (without peti-ole) and 899 μm wide, including petiole 1321 μm long (Figure 2). Body color greenish-brownish. Anterior idiosoma margin concave. Dorsal fur-row completed extending onto lateral sides of id-eosoma. Petiole very long, with two curves satea anteriorly. Petiole ending in some hooked exten-sions, like many swimming setae. The distance from the front edge of dorsal furrow 190 μm. Ca-pitulum 155 μm, chelicerae 167 μm and nail 72 μm in length. The distribution parts of the setae in the form of palp; 1, 2 and 3. There are long se-tae on the palps. The upper parts of palp; 32-55-60-57-32 = 236 μm in length, the lower parts; 22-32-22-52-27=155 μm in length and the palp heights; 30-55-57-52-10 μm in length. Coxae lengths; 270-250-310, 380 μm. Genital plates narrowed towards the sides of the body width of the genital plates 650 μm. Genital opening is 70 um. There are swimming hairs on the legs and there is a protrusion on the leg of fourth. The lengths of legs; LegI: 70-90-110-160-180-230 = 840 μm, LegII: 80-90-100-180-210-250-140-160= 960 μm, LegIII: 90-120-170-150-120-180= 830 μm and legIV: 120-150-180-250-140-160 = 1000 μm. 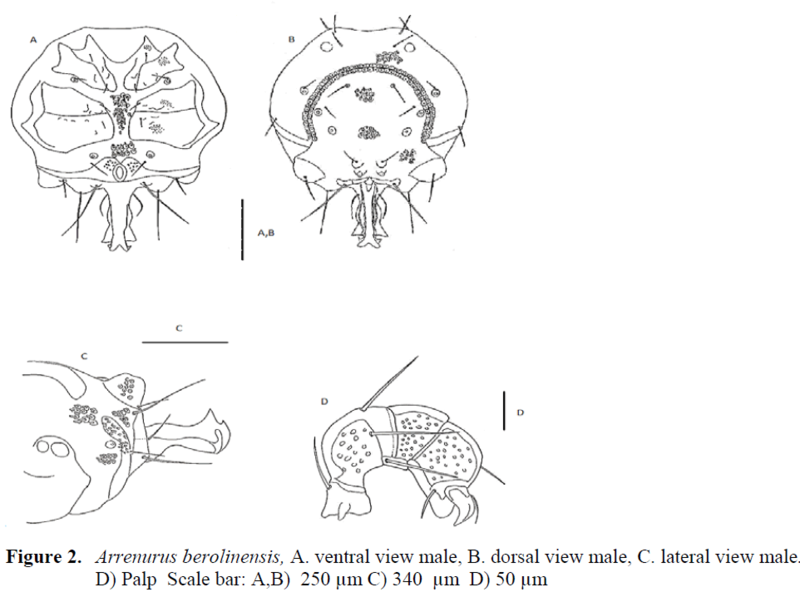 Figure 2: Arrenurus berolinensis, A. ventral view male, B. dorsal view male, C. lateral view male. D) Palp Scale bar: A,B) 250 μm C) 340 μm D) 50 μm. For the male specimens of Arrenurus berolinensis, the length and width of Idiosoma were reported as 960 μm (without petiole) and 899 μm, respectively (Smith 2007). In addition, Idio-soma plus petiole, that is the body length, was 1252 μm as the length of petiole was 389 μm (Smith 2007). These measures are almost similar what we have determined for A. berolinensis male specimens collected from the Karakuyu Lake. In addition, Smit (2007) reported that dor-sal furrow is incomplete and not extending to the lateral sides in male specimens. On the other hand, the dorsal furrow is clearly complete, that is it extends to the lateral sites. Although genital plate completely surrounds the sexual plate in our male samples, genital plate of Smith’s (2007) male specimens does not surround the sexual opening. The length of Petiole and its appearance is similar to a large extend by the Smit’s speci-men. In terms of other properties, there is not much differences between our samples and Smit’s samples. The length and width of Idiosoma for female specimen of A. berolinensis were reported as much as 1166 μm and 1085 μm, respectively. In addition, the front edges of Idiosoma were shown as a slight concave for both male and female specimens (Smit 2007). This is also the case for our specimens. Males of this extraordinary species are rela-tively easy to identify with outstanding features of their Palps. On the other hand, this diagnose is very difficult for females (Smit 2007). Although there are very few records about this species, it is seen that A. berolinensis mostly lives in the muddy swamp areas. Almost all of the collected specimens were living in peat pits having neutral pH and low nutrient and mineral content. Uncommonness of such kind of areas could be explanation of why this species reported rarely. Morphology, body measurements and habitat characteristics of our specimens are large-ly similar to previous records. Lundblad, O., (1962). Die Hydracarinen Schwe-dens. ii., Archiv för Zoologie, 14: 1-635. Protz, A., (1896). Beiträge zur Kenntnis der Was-sermilben, Zoologischer Anzeiger, 19: 407-411. Smit, H., (1999). Arrenurus boruzkii, a water mite new to the Dutch fauna, with some notes on its morphology (Acari: Hydrach-nidia), Nederlandse Faunistische Mededelingen, 9: 11-14. Smit, H., Didderen, K., Wiggers, R., (2007). The first record of the watermite Arrenurus bero-linensis from the Netherlands, with the first description of the female (Acari: Hydrachni-dia), Nederlandse Faunistische Mededelin-gen, 26: 39-42. Ssujetov, S., (1931). Zur Kenntnis der Gattung Arrenurus (Hydracarina), Zoologischer An-zeiger, 94: 213-218. Viets, K., (1911). Arrhenurus berolinensis Protz, Schriften der Physikalisch-Ökonomischen Gesellschaft zu Königsberg, 52: 235-238.